We manufacture paper with integrated labels according to your specifications and wishes. Up to 12 printed inks are no problem. The integrated label can be placed on the paper at any given location you need and can also be customized to fit your specifikations. We are at your disposal for the technical implementation and graphic processing. As a specialized manufacturer of high-quality integrated paper products. We have developed and offer integrated form solutions that are extremely handy and elegant. Our integrated labels are the perfect solution for mail order forms, Invoice forms and delivery notes, since they are easy to handle and time-saving. All of our paper-integrated labels can be easily be used with any commercial printer. Integrated label forms are used by many online retailers for logisitc documentation processes. What used to requirer multiple sheets e.g delivery note, label etc. can now be compined to one. This is enviromental friendly and reduces time and cost by usind one sheet for it all. The best part is that human errors are reduced by simplicity and effectivity of the integrated label form. The advantages of the stock forms are obvious: you only need little storage capacity and benefit from short delivery times. As address labels, invoice label sheets or dispatch notes. The application areas of our integrated labels are diverse. Let your product become a visual highlight. We improve ia. 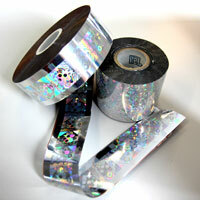 With hologram foil, hot embossing holograms and special colors.. The laminated surfaces are glued to the edge with the carrier form and do not allow any hooking in the transport system of the printer. During the production process, no wet glue is used, which can affect sensitive papers. The material used as back cover is only a few μ thick. The stack remains flat and is easily processed by all printers. An integrated label can be placed any position on the sheet. Thanks to our precision machines, the back-sided films are efficiently processed and the material expenditure is thereby minimized. 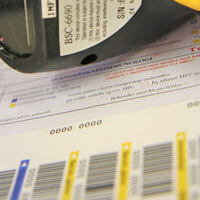 YOUR advantage as a customer is quickly obvious: the use of integrated labels saves costs and time. We process your orders in any size, either as a sheet, a stack or a roll - according to your special requirements. Are you looking for other labels or want a specific label material? This is also possible with us. 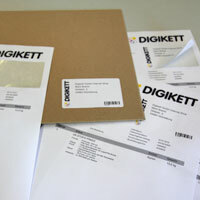 In the case of appkied labels - sandwich labels - the labels are applied with the carrier material onto the cover sheet. This allows you to select special label material which is, for example, temperature-resistant or weather-resistant. This method is often used for pharmaceutical labels. Sesametiketten, or as we call them "integrated labels", are seamlessly embedded in the form. The sesame label is generated in the form by applying a thin adhesive material to the back. 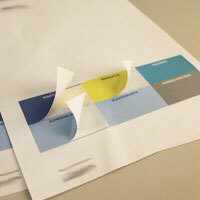 The papers with integrated labels can easily be used in any printer, just like conventional printer paper. Are you looking for an extraordinary format, a different positioning on the paper or a fancy design? When designing the paper with integrated labels, almost everything is possible. The form can be printed according to your wishes. The position of the label is freely selectable: top, bottom, right, left or center are no problem for us. There are virtually no limits to the shapes and the number of labels. Whether you want round, square or special shapes. Each form can be produced with any number of labels, ideal for your application. So far, commercial forms are provided with so-called sesame labels. In practice these often lead to transport problems in high-performance laser printers, since the stacked forms are either applied on one side or are difficult to transport in the device. There is also the possibility that labels in the printer can be loosened, making the device almost useless. Our form solution with integrated labels now provides a lasting solution. The processing runs smoothly - the adhesive force of the label is always reliable.